Today was my 7th all grain brew and this post is a quick précis of the day. The most exciting bit was getting to use my new kettle. Father Christmas (well, my Mum and Dad) kindly got me one of these, a Thorn Electrim Boiler. This is going to be a massive time saver, compared to heating and boiling using a large pot on an electric hob. The unit comes with a single regulated heater element and a plastic tap. I decided to replace the plastic tap with proper ball valve and barb, and add a hop filter to the rear of this via a coupler to allow me to easily remove wort from the kettle post-boil and leave the hops and trub behind. You can see these modifications below. These optional extras ran to about £30 but will be re-usable should I upgrade to a keggle in future. As mentioned in a recent post, I wanted to brew an Australian hopped beer and split it, fermenting half with trappist yeast and half with chico yeast. On the day, I decided to keep things simple and brew just one, opting for the trappist. The recipe was finalised (below) and the brew day kicked off after a quick leak test of my handwork on the kettle! Given I intend to brew this again and ferment with chico yeast, I removed the final Topaz addition as I only have 100g to hand and needed to save half. 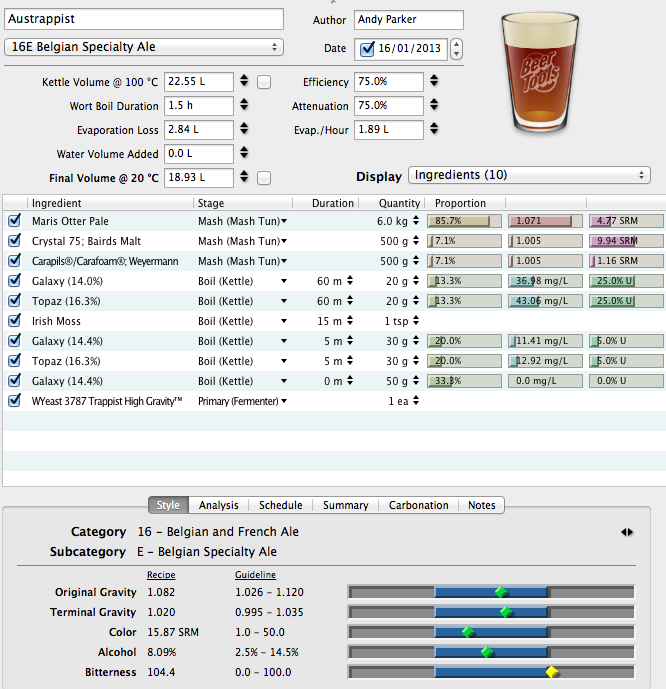 The Belgian version won't be dry hopped as I want the aroma from the yeast to be prevalent. The brew day itself went fairly smoothly. I ran into the same issue I have in previous brews with the run off getting stuck due to malt getting under the false bottom in my mash tun. This was particularly frustrating as having identified the root cause, I forgot to fix it! I need to extend the length of the hose attaching the false bottom to the barb on the back of the ball valve, so that the false bottom sits clear of the tap recess. I'll sort this and post a photo to illustrate the problem and fix ahead of my next brew. I was really pleased with the new kettle. I used it as a HLT and it heated up 17L to 72 degrees in about 30 minutes. Once I'd collected the wort, it reached boil in a little under 40 minutes - roughly twice as fast as before. Once the boil was done, I let it rest for 10 minutes before transferring to my trusty old pot for cooling. I ended up with 16 or so litres of wort at a starting gravity of 1.087 (above target - oh well!) and pitched the Wyeast 3787 smack pack at 20 degrees. Fingers crossed for a good fermentation and a slightly bonkers beer. Got sent here through a link on Steve Lamond's site. Interesting that your first forays seem rather similar to mine. 1. Use boiler as HLT, add liquor to mash tun, add grain. Check. 2. 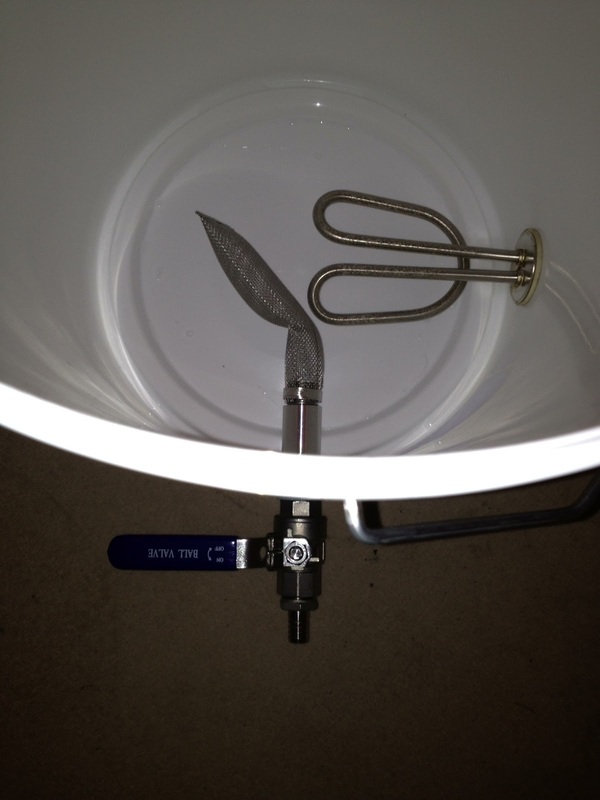 After mashing, collect first runnings - presumably into your boiler, in which you will you then boil wort with hops. Check. See my issue? I can only presume you collect first and second runnings in another vessel, transfer the lot to the boiler and then boil? That seems the logical step, but no one mentions it, so I wonder if I'm being a bit dull! Sorry if that all sounds a bit stupid, but is that what you do?! PS Not sure about the Thorn you use, but my advice is to watch that element. I blew my first one by switching it on without water (durr), and they have a tendency to short out if there is lots of crud around or on the element. I now always remove mine and stick it in de-scaler. I also have a spare, as I have been left with 20l of partially boiled wort before now - very frustrating!! Hi Paul, thanks for the advice on the Thorn. I'll keep a close eye on it. I've only used it a couple of times and have given the element a good scrub afterwards, so hopefully it'll behave itself. Regarding your process question, yes, I collect to another vessel then transfer the lot back in to the boiler once I'm done collecting post sparge. I actually use an FV for this purpose, then sanitise it again before transferring the cooled wort back to it (so yes, uses more water but not too much just to give it a rinse with some starsan).